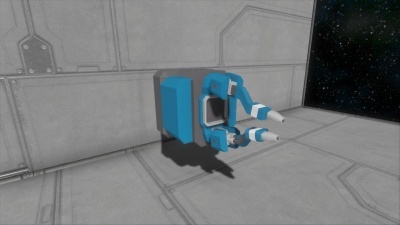 The Welder block functions as a larger version of the Welder Tool. It assembles blocks it comes in contact with when turned on. However, it is on a larger scale/radius and can be placed on both large & small ships. When constructing blocks or components building materials are pulled from connected Cargo Containers or the welders internal inventory. 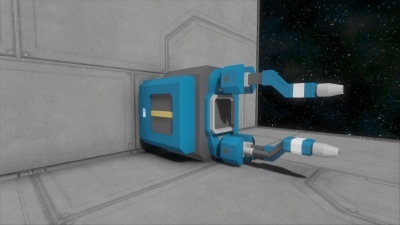 The Welder is used to assemble blocks, and it'll retrieve the Components from neighboring connected Cargo Containers or its internal inventory. It's function is exactly the same as the Welder Tool, so it will assemble any blocks, provided the components are already placed there. It assembles blocks at an increased speed compared to the hand welder, and also it affects a 2-3 (large) block radius, making it faster overall. It should be noted however that the more blocks that are inside the radius of the welder, the slower it will assemble them. The weld speed is split evenly among all the blocks in its radius. The same principle is applied to small-ship blocks as well. The Welder has warning indicators on the tips for when it is in operation, which show in red . Caution should be used when operating the welder. Active welders (with lit indicators, not necessarily in the process of welding) damage players within their area of effect for 80% of health per second (4 hits per second for 20% each). It takes drastically longer to weld 100 small ships blocks at once, than 10 small ship blocks. This is because the welder evenly builds all blocks inside its radius. So when the 100 small ship blocks are inside its radius, even though they are small ship blocks and require little resources to build, it will take 10x longer. The best solution is not more welders, but to slowly bring the welder across the object. It is faster to build 10-20 small blocks at a time, than 100 blocks at once. When a player uses large amounts of welders anywhere in a sector, even outside rendering range, other players might experience small bits of lag while it is in operation. Welder introduced for both large and small ships. This page was last modified on 23 May 2018, at 01:46.